When Do You Have “The Talk” About Driving? Dents on the car that can’t be explained. Being startled when the tires run onto the warning strips when driving on the highway. Needing to be reminded about the stop sign in the neighborhood. Braking too hard and fast because of not slowing down soon enough when in traffic. All are signs that your elderly mother or father is ready for “the talk” about driving. If you have concerns about your parent’s safety when driving, then you need to have a conversation about it. Don’t put it off until later. Yes, it’s uncomfortable. It’s your parent and they always knew best, didn’t they? In this case, it’s your turn to know best and step up to protect them, and others, on the road. According to the National Highway Traffic Safety Administration, there are over 40 million senior drivers on our nation’s roads. If no one speaks with these drivers, to caution them about their reduced driving skills or even going so far as to take away their keys, the number of crashes will increase as will the number of fatalities. How to have The Talk? Acknowledge that this is difficult for your parent. You can begin the conversation with something like “Dad, I know this will be hard for you to hear, but we really do need to talk about your driving”. Then you can refer to the latest incident or sign you are aware of and share your thoughts, leading to the very real possibility of accidents worse than minor fender benders or bumps. Have the conversation privately. This isn’t the time to have a family meeting because your parent will think you are “ganging up” on him. It also isn’t an intervention or really a major issue. If you approach it as a son or daughter showing concern for the safety and well-being of your parent, it will go a long way toward making sure the conversation stays on track and is productive. Avoid confrontation. This isn’t about accusing your parent of anything or assuming that you will be taking away the keys. It is about you bringing up concerns and the possibilities of unsafe driving habits. Also, focus on the capabilities your parent has, not his age or any illnesses he may have had. Stick to factual rather than emotional examples, which is why it is important for you to have actual incidences to refer to. Stay calm and don’t raise your voice and especially don’t get pulled into unrelated issues. Know when to stop the conversation. The moment it seems that you’re just not getting through to your parent, stop. Begin the conversation again another day. There is no point in pushing the issue at this point. For most people, this conversation about your parent’s driving is a difficult one. No matter how difficult it may be, it’s important that you have it and that you initiate it. 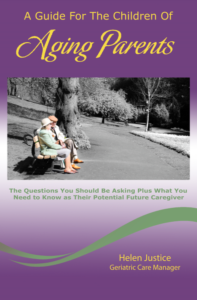 Your parent could be having thoughts about needing to stop driving but isn’t ready to address the issue on their own. Your help can keep your parent, and others, safer on the road.